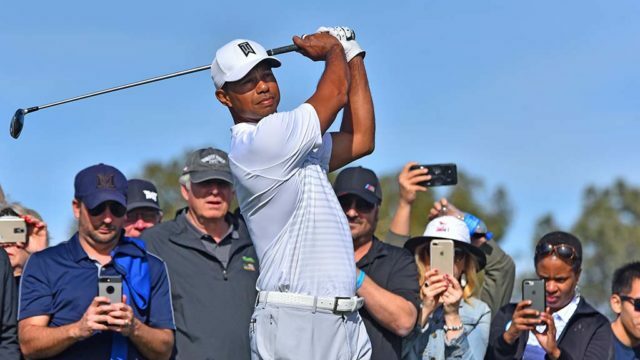 Golf legend Tiger Woods, a seven-time winner of the Farmers Insurance Open, will play again this year in the PGA tournament beginning next week at Torrey Pines Golf Course. Woods’ participation was announced Wednesday by the Century Club of San Diego, the nonprofit organization which plans and hosts San Diego’s annual PGA Tour event. After being sidelined by back injuries for two years, Woods began a comeback in 2018, starting at Torrey Pines. Other golfers who have committed are Jason Day, Justin Rose, San Diego native Xander Schauffele, Jon Rahm, Rory McIlroy, Tony Finau, Rickie Fowler, Patrick Reed, Marc Leishman, Jordan Spieth, Patrick Cantlay, Alex Noren, Gary Woodland and Hideki Matsuyama. The field is not final until the commitment deadline on Friday at 5 p.m.
Tickets for the tournament start at $60 and are are available online.